Non-stop or one-stop flights to Anchorage are available on multiple carriers from most major cities in America and Europe. The last leg is a short flight on Alaska Airlines to Nome, often with a quick stop above the arctic circle in the village of Kotzebue. When reserving your fishing trip, ask us about our Flat Rate Airline ticket service option. When booked far enough in advance, we are able to lock in a fixed price for your travel needs and act as your travel agent to reserve your seats. Nome (65 N, 165W) is located along the Bering Sea coast on the southern side of the Seward Peninsula, 126 miles south of the Arctic Circle, and 105 miles east of the International Dateline. The Kigluaik mountains form the west end of the North American Continental divide. With Russia to the west, the Bering Strait region is truly where the east meets the west. The region boasts the historic Bering Land Bridge National Preserve, a crossroads of two continents, rich with remnants of early human history, as well as hot springs and old lava beds. For a small town, Nome is quite well known. Nome is most famous for its gold mining history, where Wyatt Earp once landed. Nome is also the end of the Iditarod Trail Sled Dog Race, an 1100 mile race across Alaska from Anchorage to Nome. New York Broadway style plays are put on by the Nome Arts Council, the Bering Sea Ice Golf Classic allows you to test your golf skills on challenging turf, and you can take a dip in the Bering Sea during Nome’s Memorial Day Polar Bear Swim. When you book a trip to Alaska, you assume all that it has to offer; great scenery, great fishing, and of course, weather. The weather in Western Alaska can vary greatly throughout the summer, from rain and wind, to warm, sunny days. Since all of our trips require helicopter flying, weather will be a consideration for every operation, and safety will not be compromised. The helicopters are able to fly with minimal ceiling and visibility requirements, and down days are very rare. When it does occur, there is still plenty of fishing opportunities via road access. During a day off you may also choose to explore Nome, or take a drive out one of our scenic roads where remnants from Nome’s gold mining era can be seen. Daytime highs during the summer on the Seward Peninsula average 50-60° F, although 70+° F days are not uncommon on the inland rivers that we fish. Lows average 40-45° F, with record summer low temperatures around 30° F. Pack several layers of clothing to stay comfortable and dry in 50-70° F, rain or shine. Helicopter transportation will be provided by Bering Air, Inc., using the Robinson R44. The R44 is a comfortable, safe, four-passenger helicopter that is perfectly suited to our fly fishing adventures. The old saying that “getting there is half the fun” certainly applies here. 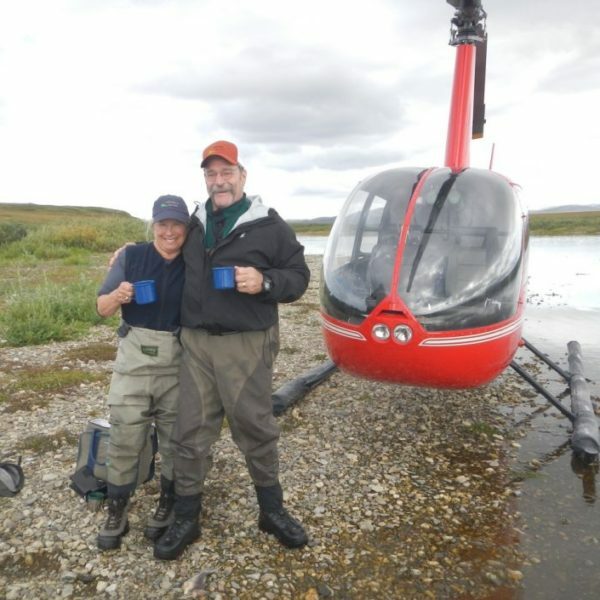 Depart right from the cabin for an awesome view of the Alaskan wilderness, with a chance to see bear, moose and musk oxen, then pick a bend on the river to start fishing. Helicopters allow access to places unreachable by other means. The helicopter holds 3 passengers, and multiple shuttles of 10-20 minutes each are done until everyone is on the river. At the end of the day there is no set rendezvous point, since the helicopter can land on any gravel bar that the group wishes to stop on. The passenger weight limit is 250lbs per person. Bering Air has a long-standing reputation in Western Alaska as a quality air carrier with a superb safety record. They operate a large fleet of fixed-wing as well as rotary-wing aircraft year round, and have been in business since 1979. You will be flying with professional pilots who make their living flying year-round. Any medication you are taking, always plan for a couple extra days. We will provide the rest of the gear required to make your trip as comfortable as possible. Please let us know in advance if you do not have any of the above listed gear and would like us to provide it for your trip. If it’s an excellent fishing adventure you’re looking for, search no more. The ability to access some of the most remote and untouched fly fishing venues is their specialty and they do a superb job of making it the most comfortable and adventurous experience that you will have.